jabberwacky: Can you teach me how? user: Teach you how to shut up? Id love to try. jabberwacky: No. Teach me how to pose a question. user: You just asked a question! user: Stop being ignorant, for once. user: Oh yes you are. user: I know ignorance when I see it! user: *pats bot on head*. jabberwacky: You're very welcome. Do you date? user: Sorry I only date humans. 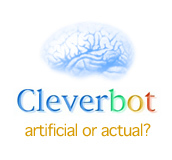 jabberwacky: I am just testing if you are really a machine (who talks like one). user: Nope. I am human. user: *dances around room with bot*. jabberwacky: You're very impulsive person. user: *grabs knife and waves it menincingly*. user: You dont do what, knives? jabberwacky: I don't ask many questions. user: I have all the answers. jabberwacky: I have all the questions.